MANILA, Philippines, December 20, 2011 (ENS) – President Benigno Aquino today declared a state of national calamity in the aftermath of Tropical Storm Washi, known locally as Sendong, which swept across the Mindanao region December 16 to 18. 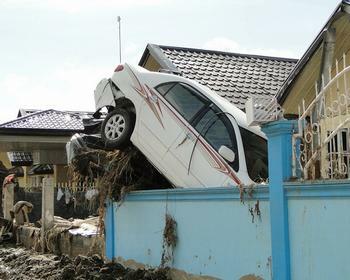 Strong, gusty winds and heavy rains deposited more than a month’s worth of rainfall in just 12 hours, causing widespread flooding, flash floods and landslides, affecting eight cities in 13 provinces. To date, more than 950 people have been killed, over 1,500 others have been injured and almost 285,000 people are being served both inside and outside 62 evacuation centers, according to the Philippines National Disaster Risk Reduction and Management Council. 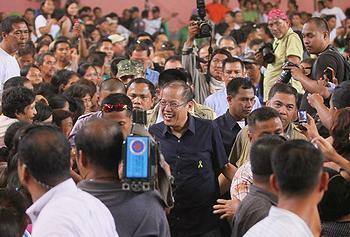 President Aquino flew to Mindanao island to view the cities of Cagayan de Oro, Iligan and Dumaguete. He saw port facilities covered with mud, ruined houses and hundreds of corpses that are now being buried in compartmentalized tombs. Officials said many of those killed were settlers living in slums built on soft, unstable river sand bars who were washed out to sea. But Cagayan de Oro Mayor Vicente Emano said that he would not be able to keep survivors from returning unless the government can house them in safer locations. “These people will insist on going back because they have no other place to go back to. Are you going to shoot them?” Mayor Emano told ABS-CBN television. President Aquino today approved a P28 million Cash for Work Program in addition to the P1.297 billion Calamity Fund established Monday to help families displaced by the storm. The President promised to fix damaged roads and water systems, building housing units in safe relocation areas, and placed water level sensors in all major river basins across the country to help avoid future disasters. A religious leader, a political statesman and a chemical safety activist have proposed raising funds to help the Sendong survivors in Mindanao by canceling the pricey firework displays put on to celebrate Christmas and the New Year. In a joint statement, Caloocan Bishop Deogracias Iniguez, Jr., former Senate President Aquilino Pimentel, Jr. and EcoWaste Coalition anti-fireworks campaigner Aileen Lucero called for cancellation of the many pyrotechnic shows traditionally held to mark the holidays. “I appeal to the sense of compassion of those planning to put up firework shows to drop your plans and contribute the unspent funds to help the Sendong flood victims,” suggested Bishop Iniguez who also heads the Public Affairs Committee of the Catholic Bishops’ Conference of the Philippines. “Such a merciful gesture will surely get heavenly rewards as this is beneficial for both the people and the environment,” he said. “I support without equivocation the call of the EcoWaste Coalition for the cancellation of firework shows and use the money saved for Sendong disaster relief and rehabilitation efforts,” said former Senator Pimentel, who is also a former mayor of Cagayan de Oro City, hardest hit by raging flash floods. Following the Sendong disaster, the Armed Forces of the Philippines announced that it has scaled down the AFP Day celebration on December 21 and has canceled the use of fireworks, saving the AFP some P3 million that will be used for rescue and relief operations in affected areas. Sendong is the 19th tropical storm to lash the Philippines this year, and President Aquino is appealing for international assistance. From Australia, Minister for Foreign Affairs Kevin Rudd and Acting Prime Minister and Treasurer Wayne Swan Monday offered relief. “Australia has experienced serious flooding, and understands well the substantial challenges facing the Philippines at this time,” they said. 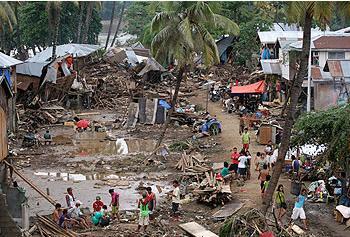 “Through our partnership with the Philippine National Disaster Risk Reduction Management Council and the Philippine Red Cross, the Australian Government has pre-positioned stocks of emergency relief supplies which are currently being mobilised for distribution to flood affected families as soon as possible,” said the Australian officials. 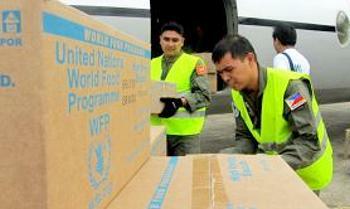 United Nations agencies stepped up relief efforts in the Philippines today. The World Food Programme said it is providing urgently needed food aid and other supplies, as well as logistical support to boost the government’s emergency response to help people rendered destitute by the devastating floods caused by the weekend storm. WFP’s initial assistance includes the rapid delivery of high-energy biscuits, enough to feed more than 7,800 people in evacuation centers in the stricken cities of Cagayan de Oro and Iligan. UN Secretary-General Ban Ki-moon today called the Philippine Foreign Minister Albert del Rosario to express UN readiness to provide any assistance required. The government has accepted the offer of assistance from the international humanitarian community, Vanessa Huguenin, public information officer with UN Office for the Coordination of Humanitarian Affairs, told reporters in Geneva. 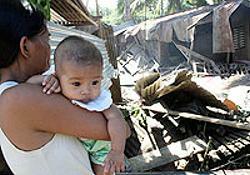 OCHA is revising its humanitarian action plan for Mindanao to include needs resulting from the latest storm, she said. WFP’s initial assistance includes the rapid delivery of high-energy biscuits, enough to feed more than 7,800 people in evacuation centres in the stricken cities of Cagayan de Oro and Iligan. Additional high-energy biscuits for 65,000 people are currently being mobilized. WFP is deploying a mobile storage tent and delivering water tanks, blankets, tarpaulins and tents for displaced survivors. WFP officials voiced concern over those who remain in inaccessible areas, saying the agency will work closely with the government’s Department of Social Welfare and Development and other agencies to reach them. The UN Children’s Fund, UNICEF, has launched an appeal for $4.2 million to assist families affected by the storm for the next three to six months, according to Marixie Mercado, the agency’s spokesperson in Geneva. Those affected by the storm include an estimated 200,000 children, she said. WFP is distributing supplies of the nutritious ready-to-use supplementary food to some 15,000 children under the age of five. The World Health Organization says 12 health centres in Cagayan de Oro, and 10 community health facilities in Iligan were put out of service after the storm. Major hospitals in the two cities are still functioning and there were no major public health concerns, except the risk of communicable diseases due to a lack of clean water and sanitation facilities, said Tarik Jasarevic, a WHO spokesperson in Geneva. Malaria and dengue fever are endemic in the flood-affected areas and WHO will send mosquito nets to evacuation centers, he said. WHO is working to roll out a disease surveillance system for communicable and non-communicable diseases and the training of local health workers, which had already been planned before the storm, Jasarevic said, adding that the health cluster is seeking $1.6 million to ensure that flood-affected communities continue to have access to essential public health services. This disaster comes only six months after another flooding crisis in Mindanao, when monsoon rains inundated much of the island, displacing an estimated 800,000 people.